Parties - at school, work or church - are easy to coordinate with a sign up sheet on TimeToSignUp. Don't hand out a sign up sheet at practice or games. Email the team and watch the participants volunteer like never before. Of course you can completely customize with game date and/or specify what people should bring. Change the colors, too! Tired of 15 macaroni and cheese dishes? Use TimeToSignUp to coordinate lunches and dinners so that all of the important foods are claimed - especially dessert! Easily coordinate meal donations. Include the exact date(s). Even give instructions about allergies and where to drop off the food. Need committee members? Use TimeToSignUp so that participants can sign up with ease. 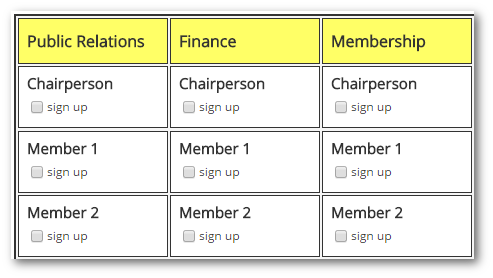 Unlimited committees, unlimited members! We have a lot of them.